Natasha Birch, Anne Gowthorpe, Anne Stephenson, Lizanne Southworth, Fiona Lambert, Liz Bramley, Margaret Denness, Lesley Sherburn and Rachel Longbottom at the 24-hour tennis marathon. Bubwith Tennis Club has hosted a 24-hour tennis marathon. 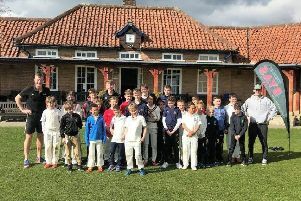 Members of the club of all ages joined in as well as those from other local clubs, including Goole, Pocklington, Market Weighton and Cliffe. A spokeswoman for the event said: “What a wonderful 24 hours packed with such excellent tennis. Anna Airaksinen, Jon Clay, Alastair Southworth and Claudia Nisbit during the night slot. “A great success, and thank you to all those who participated and to those who provided food and drinks throughout the whole event. “Monies were raised for Bubwith Tennis Club in conjunction with The Great Get Together (Jo Cox Memorial Event) at Bubwith Leisure Centre. Every hour slot was filled, going through the night with the floodlights on. For more information on Bubwith Tennis Club contact Shaun on 01757 288541. The committee: Margaret Denness, Lizanne Southworth, Anna Airaksinen and Liz Bramley.